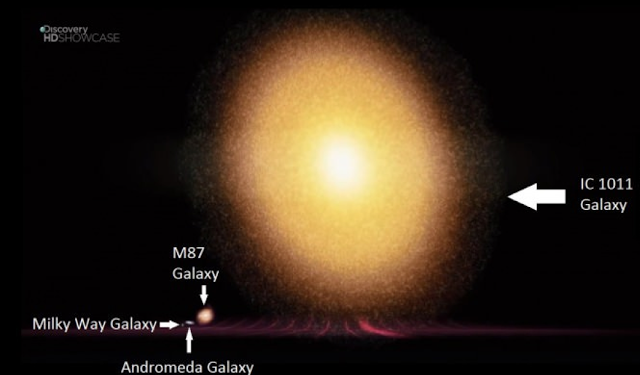 The biggest galaxy in the known universe is basically staggering in size. But in order to understand its scale, you need to comprehend a little something about our own galaxy. For starters, the Milky Way galaxy is about nearly 100,000 light-years across. Astronomers estimate that Milky Way has nearly 200 billion stars. Our closest neighbor galaxy, the Great Andromeda galaxy, is 2.5 million light-years away. It is about twice our size, coming in nearly 200,000 light-years. Now, the largest known galaxy in the known universe is IC 1011. And it is almost 6 million light-years across. Take a minute to try and comprehend that. This galaxy could simply swallow the Milky Way, Andromeda, and all of the space in between. It’s not just bigger than our galaxy; it’s bigger than our corner of the universe. The Milky Way is a mere 100 thousand light-years. IC 1011 is 6 million. You can learn more about IC 1011, and how it got so big, in the video below.